When Scott Frost was introduced as the Huskers next head football coach back in December, he wasted no time pointing out one of his goals as the program’s new leader: elite Nebraska talent stays in Nebraska. 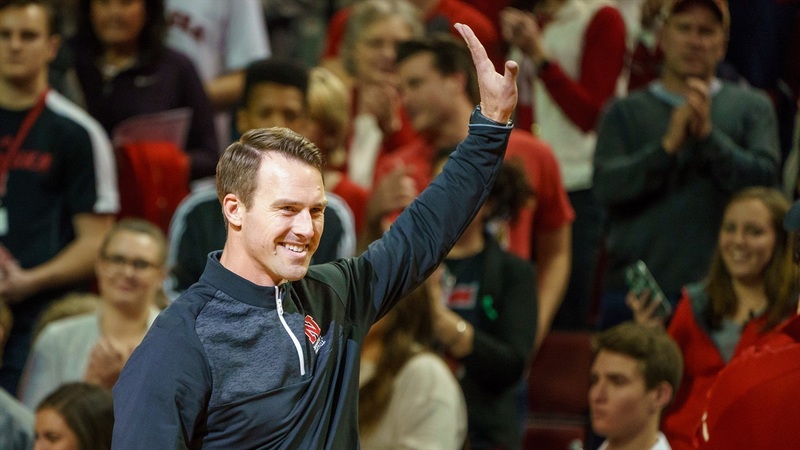 “When you have a bunch of kids from the state of Nebraska that are in this program, those are the type of players that would bleed for this place and are going to work hard to make this work,” he said then. “Guys that are really pulling for Nebraska. When I was growing up, every kid in the state of Nebraska dreamed about running out here on this stadium, on this field wearing a red ‘N’ on their helmet. Frost, inside linebackers coach Barrett Ruud and the rest of the Husker coaching staff backed up that talk. Late Saturday night, Omaha Burke linebacker Nick Henrich committed to Nebraska’s 2019 class. ‍Henrich was the guy for Nebraska. If Frost was going to keep that promise, Henrich was going to be the poster child. He appears ready to do just that. A 6-foot-4, 210-pound inside backer, Henrich is the top-ranked player in the state of Nebraska, a 4-star athlete who was at the very top of the team’s board and the 87th-ranked player in the country according to 247Sports. The talent is tremendous. On film, the Burke star showcases the potential to be the next Nebraska star. His anticipation at the linebacker spot is special. His combination of size and athleticism is, too. And on top of that, he’s filling a position of need. Henrich will join an inside linebacker group next season where the major players will include two seniors (Mohamed Barry and Will Honas) and a junior (Avery Roberts). Three-star Jackson Hannah is already committed, but Henrich is huge in restocking Ruud’s arsenal. He shoots gaps, he wraps up, he doesn’t get caught out of position, he has the speed to chase down plays from the backside, he doesn’t miss tackles, he looks unblockable at times and he plays the game the right way. Ruud is dancing right now. Henrich’s commitment to the Big Red extends beyond his on-field ability, though; its importance is measurable in more than just sacks and big hits. Ruud tweeted about the announcement twice. Adrian Martinez tweeted about it. Zach Duval tweeted about it. The entire program knows they just picked up a major, major win. He flirted with Wisconsin — his only official visit was to Madison, before coming right back to Lincoln for an unofficial after — but picked the Huskers and that fact in and of itself is enormous in scope as the new Nebraska takes off. It’s validation. It’s acknowledgment that this is heading in the right direction. At the end of the day, there was no real obligation he had to the program. Winning Florida kids is cool but if you can pull Florida kids AND keep your homegrown talent, that’s something special. Fans have seen the likes of Noah Fant at Iowa and Harrison Phillips at Stanford. Henrich anywhere but Lincoln would have hurt. Henrich in Madison would have been worse. Instead, the Huskers won out over a list of teams that also included Oregon, Texas A&M, LSU, Florida and Notre Dame. And the fact this staff did it from behind the eight ball is even more impressive. Hail Varsity’s Greg Smith has reported the Huskers had a lot of ground to make up after the coaching change. The commitment brings the 2019 class to 13 names. Henrich and fellow 4-star quarterback Luke McCaffrey provide star power (Henrich being “All ’N” could have a positive impact on the other Burke star, tight end Chris Hickman) to a class that’s pretty deep and has added eight names since June. There’s some very serious momentum for the Huskers right now. They’ve climbed up to 27th in the national class rankings. If you start out your tenure saying “too many hometown kids are playing elsewhere,” when that first star decision gets made, you better be on the right side of it. Nebraska was. It will benefit on the field because of that, but Henrich’s commitment means so much more to the program moving forward.